For the TL;DR people, the short story is that Epsilon Delta Too, Herndon High School FTC Team 519 is advancing to the Virginia State competition, because of winning the first place Inspire Award at the Northern VA Qualifier held on December 12th! The team started out the day with a robot that was still in desperate need of actual operational testing. We could score balls in the low goal and push blocks into the floor scoring area, which are fairly low scoring elements, so we needed to secure points every way we were capable during a match. In fact, we were one of the few teams capable of scoring in any of the ramp goals. Another scoring mechanism was to press levers to release zip liners. The team was concerned that a servo was permanently damaged when the flipper mechanism to press the levers was torn off the robot during the first attempt to ever use the flippers for real. Fortunately, with a couple of spacers and a servo mount screw, they were affixed more securely and functioned well for the remaining matches. This was a simple case of not testing an element under real world conditions. Somehow we managed to stay undefeated the entire day. While we were not a strong force in our first few matches, by our later matches, we were scoring most of the points for our alliance. There were 4 undefeated teams, so the next ranking points were the sum of opposing alliance scores. The leader board was shuffling all day long, but eventually we stabilized into 3rd place. We would have been very solid partner for either the 1st or 2nd place team, but #1 chose #2, and we had to battle against a bunch of climbers. The 1st place team was definitely the highest point scoring robot on the field, as in the final elimination match it alone scored 150 points (only 10 points in autonomous). Our maximum scoring potential by ourselves with what was working was limited to approximately 120 points, so even with everything going perfectly each match put us at a significant scoring disadvantage. So, while we received a respectable number of points, our alliance simply couldn’t reach the same kinds of scores, and lost the finals in just 2 matches. During the awards announcements, there was some tension early on, as it was entirely possible the team would be awarded in a non-advancement category and not receive any Inspire Award. After being nominated runner up for a couple of awards, the probability was quite high that the team would be nominated for the Inspire Award, but it wasn’t clear what level. Being the most prestigious award, it is announced last, and after not being announced as runner up or second runner up for Inspire, there was great anticipation, until they slipped in the “from small changes, come big differences” phrase, at which point we knew. Clearly at States, and hopefully Super Regionals, the robot game competition scores are going to increase, so there is still a lot of work left to increase our overall scoring potential and versatility, but at least advancement to States has been secured, so we can focus on exactly which other regionals we wish to attend and why. 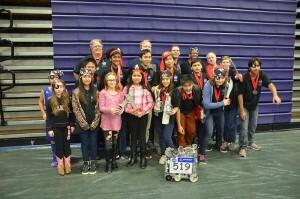 Congratulations to 519 for all their hard work and effort that has paid off so far.